If you are a user of applications like Periscope, Instagram and Facebook, then you may have noticed they have a feature in their live streams where anytime someone likes the live content, the ‘likes’ float on your screen. This article will show you how you can implement the realtime floating hearts feature on your iOS application using Swift and Pusher. Here is a screen recording of what we will be achieving in this tutorial using Swift and Pusher. From the recording, you can see that when the like button is tapped, the likes float to the top and they are also replicated on another device viewing the video being played. Now, let's begin the journey. Knowledge of Swift and Xcode storyboards. A Pusher application - you can create a free Pusher account here. Cocoapods installed on your machine - install it using Ruby by running: gem install cocoapods. Hopefully, you have all the requirements checked off. Let’s get started. After that save and close the file and run the command pod install. This should start installing all the dependencies required for the application we are creating. 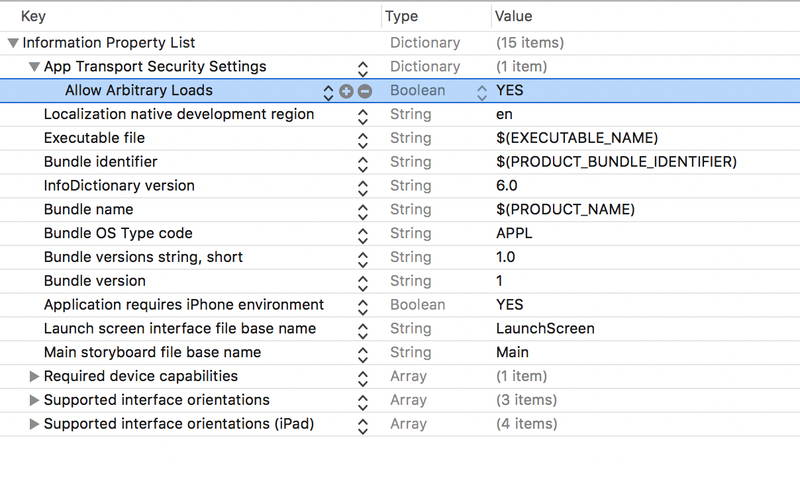 Now open the streamlove.xcworkspace file in Xcode. In this storyboard, we have a button to the bottom right of the screen, and that button has an @IBAction in the ViewController so you will need to ctrl+drag to make the connection between the button and the ViewController. // This function will be fired every time the button is tapped! // This function will be called everytime the button is tapped! In the first line, we have imported the libraries we will need, but mostly later in the tutorial. Now, let us focus on the others. The ViewController extends a VideoSplashViewController that we have not yet created. In the viewDidLoad method we have called a method loadVideoStreamSample and in that method, we are basically loading a video and setting some parameters for the video. These parameters will be implemented in the VideoSplashViewController. In the files above we just created, it basically helps you manage the video background and sets a video of your choosing as the background video and loops it forever. This can also be useful for application landing pages. However, we are just using it for a make-believe video stream. 💡 If you are using a Swift version below 3, then you can use the source code as is in the repository, however, if you use Swift 3 or above you may need these modifications to make it work. Now the last thing we need to do is add an mp4 file to our workspace. You can use any mp4 file you wish to use. Drop the video file video.mp4 into the workspace and make sure it is copied and added to the application target. If you build and preview your application now you should see the video looping in the background. Great. Now that we have the video looping in the background, the next thing we will do is add the floating heart functionality to the application. Basically, every time someone clicks the heart button, a heart icon should float to the top and slowly disappear. Open the Main.storyboard file and in the bottom right above the heart button, add a View with no background. This will be the viewport where the floating hearts will travel. You can make it a rectangle of about 250x350. Next, we will be using another library from Github to add the floating hearts functionality to the application. The file we actually need is the Floater.swift file. The library does not yet have any package manager way to install it so we will be copying the contents of the file and adding it to a file in our workspace. The library simply creates a floating heart when the startAnimation method is called and stops it when the stopAnimation method is called. 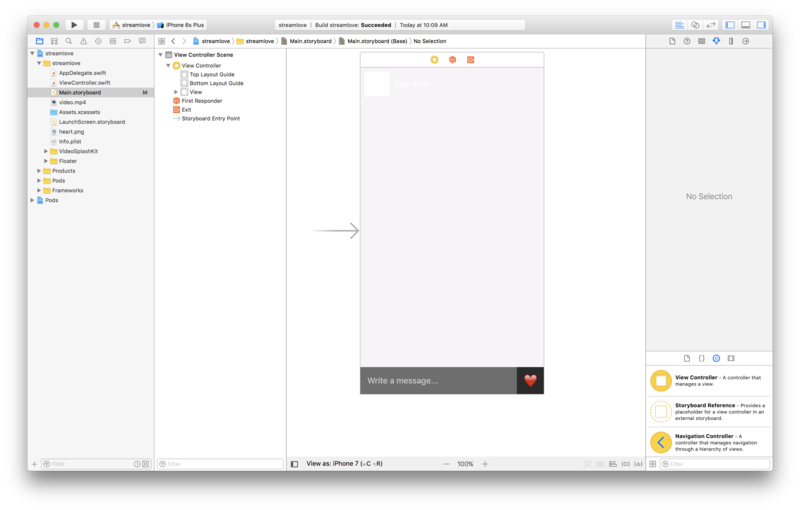 Now that the file is created, open your Main.storyboard file and add the Floater.swift View to the floater view we created earlier. This should add some new options in the side bar. These options are due to @IBDesignable and @IBInspectable that were added to the Floater.swift class. 💡 **IBDesignable** and **IBInspectable** , a way to create custom elements and the attributes. This can be directly added to the iOS Interface Builder. Read more about IBDesignable and IBInspectable. For the floater image, add a 30x30 heart image to your workspace and then select it in the floater image section. @IBOutlet weak var floaterView: Floater! Now call the startEndAnimation from the hearted method so it is invoked when the button is pressed. Make sure the @IBOutlet floaterView is linked to the view port that we created earlier in the article. Now, when you build and preview, you should see the heart floating every time the button is clicked. Now that we have successfully added the floating hearts, the next thing to do is add realtime functionality using Pusher. If you have not already, create a Pusher account, create a new application and copy the credentials as you will need them. First, we define some class properties for storing the API endpoint base URL, the Pusher instance and the device UUID. The listenForNewLikes is where we define a listener that waits for events sent from Pusher and then fires a callback when it receives the event. We will be using that to trigger the floating hearts startAndEndAnimation method. The postLike method is where we use AlamoFire to hit an endpoint (we will create this next). The endpoint will be where we send “like” events to Pusher so they can be broadcast to other listeners on the channel. ⚠️ You should replace the “PUSHER_CLUSTER” and “PUSHER_KEY” with the actual values gotten from your Pusher application dashboard. That should do it for the Xcode side of things. Now we need to create a backend application for our application. This backend app will just receive the payload from the application and send it to Pusher. The index.js file also has one route where it receives messages from the iOS application and triggers the Pusher event which is picked up by the application. In this article, we have been able to replicate the floating hearts feature that apps like Facebook, Instagram, Periscope etc have. You can use this as a base to expand the actual feature into a working application of your own.